Elevator available, rooms with balcony, PC for guests, WLAN. Television, extra bed and garage on request! The hotel consists of the MAIN HOUSE and the neighboring GUESTHOUSE. 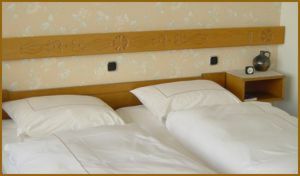 The 26 non-smoker rooms are all modern, tastefully and individually furnished. Spacious suites are offered for families (2 adults and child) or for 3 persons. The balconies on the city side afford a GRANDIOUS view over Germany's oldest city.